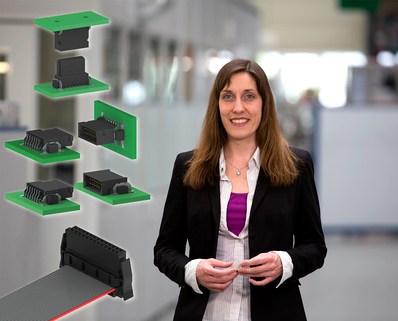 A product family of connectors offering the widest range of connection types and plug versions possible, while keeping the pitch as small as possible with the ultimate in robustness? We were up to the challenge! The One27® range offers a high level of flexibility and at the same time reliable connectors for a number of board-to-board applications. 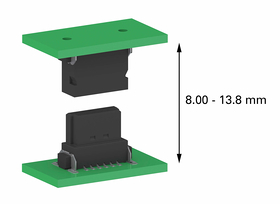 The product family is based on a pitch of 1.27 mm, offers both straight and angled types as well as connections with ribbon cable, and is available in pin counts from 12 to 80 pins. The connectors are compatible with currently available products and their performance in tests has been excellent. What are One27 connectors from ept capable of doing? What options are available for PCB connection and which termination technologies are possible? Why are One27 connectors particularly robust and easy to handle? Watch this animated video to find out the answers to these questions and more. Watch it now! Board-to-board distances from 8 mm up to 13.8 mm can be achieved using One27 connectors from ept. The male and female connectors can be inserted anywhere within a range of 1.5 mm, thanks to the absolutely secure mating of the One27 connectors. 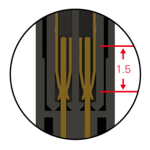 You can combine different heights to create minimal or even greater PCB distances. One27 SMT connectors provide an offset tolerance of 0.7 mm along both the longitudinal and the transversal axis. 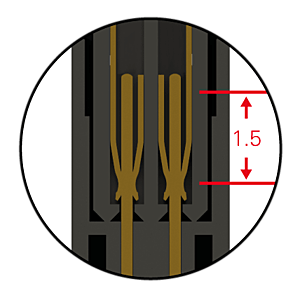 When being inserted into the male connector, the tolerance for the female connector is up to 4° longitudinally and 2° transversally with One27 PCB connectors. How can circuit boards be connected to one another using One27 SMT connectors? 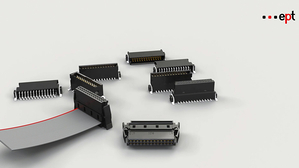 The different types included in the product family of One27 connectors make it possible to connect PCBs in parallel, horizontally, or perpendicularly and to connect ribbon cables to the circuit board. What PCB distances are possible using One27 connectors? It is possible to implement board-to-board distances ranging from 8 mm to 13.8 mm using One27 PCB connectors, with a secure mating tolerance of 1.5 mm. This means that male and female connectors can be separated by up to 1.5 mm and we still guarantee an optimal, reliable contact. Furthermore, the heights of the low-profile One27 and the mid-profile One27 can be combined with one another in four ways, enabling you to implement different PCB distances. Why is the connection between the male and female connectors for the One27 connectors particularly reliable? The connection produced by One27 connectors is established by means of a double-sided female contact that envelops the contact pin of the male connector. Even if the connection is offset, the contact on one side of the contact pin at the very least is still reliable. Moreover, the connector is plugged on the smooth, rolled surface of the female contact. Wear and tear of the contact surfaces and shavings become a thing of the past when using the One27 connectors. Are One27 SMT PCB connectors from ept compatible with other connectors available on the market? The One27 connector system is fully compatible with the connectors from other manufacturers. The compatibility of the One27 connectors has been confirmed in test reports, which you can request by e-mailing us at sales@ept.de. What applications are suited for using One27 PCB connectors? One27 SMT connectors are suited for all applications in which PCBs require a robust connection with minimal space availability. 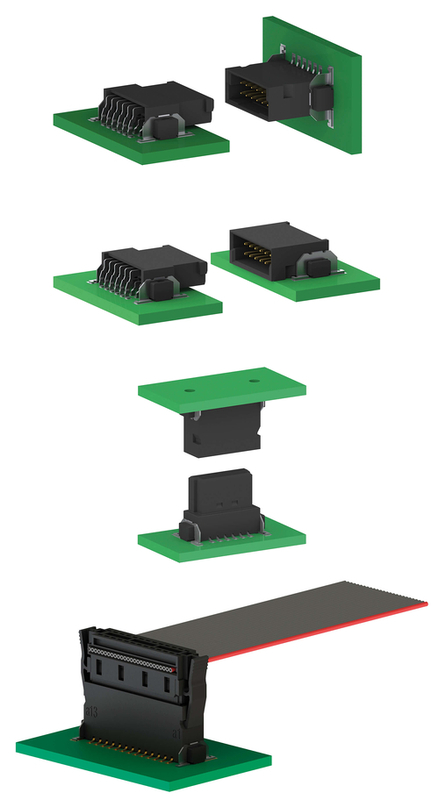 Your options for arranging the PCBs and selecting the connection types remain very flexible thanks to the different orientations, heights, and termination technologies available with the One27 connectors. It remains entirely in your hands whether you need to stack the PCBs in parallel with varying distances, horizontally next to one another, at a right angle, or by ribbon cable. What currents are possible using One27 connectors? A 50-pin One27 connector carries up to 1.4 A at 20°C ambient temperature. Request more detailed information and test reports by emailing us at sales@ept.de. What are the offset tolerances for One27 PCB connectors when being plugged? One27 connectors feature high offset tolerances. 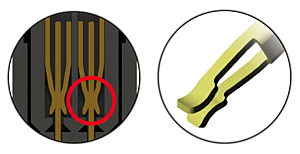 The permissible center offset tolerance when connecting a male to a female is 0.7 mm along both the longitudinal and the transversal axis. The tolerance for angular inclination is 4° longitudinally and 2° transversally. Is the female One27 IDC also available without ribbon cable? Yes. ept also offers the female IDC from the One27 product family without cables, which means you can assemble the cable yourself and determine your specific cable length. Refer to the Installation Instructions for more information. ept also offers customized cable assembly of the female One27 IDC to suit your every need. Does ept also offer the female One27 IDC with cable? Yes. ept offers the female One27 IDC based on insulation displacement technology with cable assembly. You can determine the orientation of connectors, number of contacts, and cable length. What’s more, you can choose between three different cable types. How can One27 SMT PCB connectors be processed? The One27 connector system is processed using surface-mount technology (SMT) – in other words, it is soldered directly onto the circuit boards. The connectors are shipped in tape-and-reel packaging, allowing for fully automatic pick-and-place processing. There are positioning pins on the underside of the One27 connectors, which guarantee exact positioning on the circuit board. Further, ept guarantees that the deviation from coplanarity is only 0.1 mm (max.) to ensure proper soldering when processing. Is it possible to use automatic optical inspection (AOI) for the soldering of the One27 SMT connectors on the PCBs? Yes. The One27 connectors’ contact design has been optimized for automatic optical inspection following soldering. The contacts of the angled One27 PCB connectors are arranged so that it is possible to perform an automatic optical inspection from one side. Are the One27 connectors also shipped in tape-and-reel packaging? Yes, One27 SMT connectors are shipped in tape-and-reel packaging, allowing for fully automatic pick-and-place processing. Other packaging types are available from ept on request. The female One27 IDC is normally shipped in tray packaging. Are One27 PCB connectors UL-recognized components? Yes, One27 connectors from ept are UL-recognized components in the U.S. and in Canada. Are the ept PCB connectors RoHS compliant? We confirm that One27 connectors from ept are RoHS certified and compliant with the RoHS directive (2011/65/EU). You can find more detailed information at RoHS & REACH. For us, the short shipping times offered for the One27 PCB connectors were critical in our decision to opt for the required connectors with a pitch of 1.27 mm from ept. We were able to keep the circuit board layout we had been using when we implemented the One27 connectors. It made it easy to switch to the SMT connectors from ept, and we didn’t need to make changes to design. Thanks to the offset connections on the angled One27 sockets, we no longer needed to worry about installing a second camera to inspect soldering quality. We are now able to procure the female IDC with a pitch of 1.27 mm individually, and without cable assembly. The soldering test for the One27 SMT connectors from ept provided the proof I needed of their excellent processing. I had never before looked at connectors in the selection process like that! I had never before seen clear proof of how well connectors can be soldered to the board. The soldering test for the One27 PCB connectors really opened my eyes to the product. You can actually see how sturdy the soldered connection of the contacts on the circuit board is. It was very helpful for us to be able to procure female IDC with a pitch of 1.27 mm individually, and with such a large selection of pin counts, as well. We would love to visit your facility and its beautiful location but from the quality assurance point of view we can’t find a reason to.